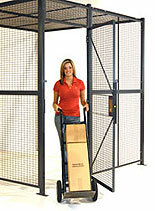 With the focus on plant security the last few years, it’s little wonder that companies are outfitting their warehouses with security partitions and cages for high-value inventory, restricted access areas, tool cribs, and other places where more physical control of the property is needed. They are superb in these functions, keeping tools, components and inventories safe for a relatively low cost vs. other kinds of security measures. Recently we started to offer welded wire partitions alongside the traditional woven cages that have been standard in the industry for years. Both are good equipment. Both will secure an area. Both will keep unauthorized people out of places they aren’t supposed to be. But they are different products, with different applications. Central location. Dallas is about as centralized as you can get, in particular when you consider its relative distance from North America’s 4 major business centers (New York, LA, Mexico City, and Toronto). 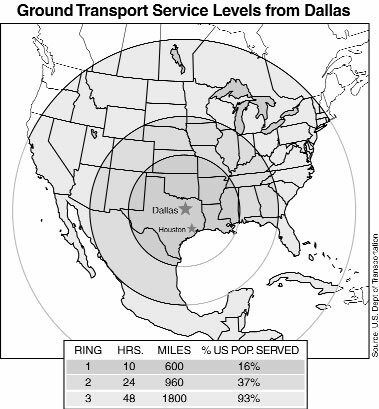 98% of U.S. consumers can be reached in a couple days by truck from DFW. Lower operating costs. Dallas warehouse space costs is inexpensive, and business costs are the lowest among major metropolitan areas. Tax rates are nearly 20% lower than the national average, and the weather is excellent. Over the years, we have compiled a large number of guides for everything material handling related. These are things that can tell you everything from what caster wheel works best on a particular surface (on a floor with oils and greases you would want phenolic wheels, for instance) to safe ladder usage, to mezzanine decking advice. Conveyors are extensively covered in our guide areas (MHIA has recognized this resource in its annual content awards). There are lots of guides, and if you’re trying to specify a particular kind of equipment, it’s a good bookmark to have.